The Children of Cherry Tree Farm was first published in 1940 by Country Life and was illustrated by Harry Rountree.The story opens up with three bored children, Rory, Sheila and Benjy, gazing out onto a busy London street. Penny, their younger sister, is downstairs. Rory is thirteen and Sheila is a year younger. Benjy is 10, a thin and quiet boy who spends most of his time reading about animals and nature; Penny is 7, the baby of the family, she hates being the youngest and is always trying to be included in what her older siblings are doing. All of the children are thrilled at the thought of six months at Cherry Tree Farm. London was very dull and boring for them in the springtime and being allowed to run wild in the country far away from bustling streets was very exciting. It explains in Chapter II that they had never been allowed to have pets in London and that all they had been able to do was to make friends with the dogs in the park and feed the ducks there. Mother comes into the room soon after Penny and tells the children when they are going but she can’t come with them as she and Daddy will be going to America. The next two days the children are in a great excitement packing their clothes and toys. They are going to the wild! 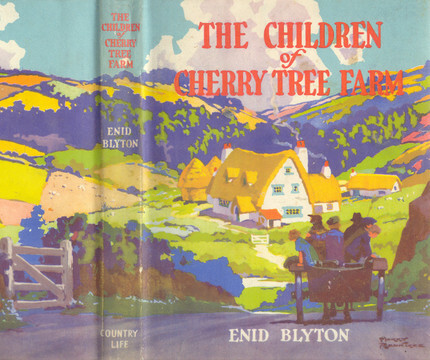 At the beginning of Chapter II the children are travelling by train to Cherry Tree Farm. After a long and exciting journey they finally reach their last stop – Cherry-Woods. Auntie Bess and Uncle Tim are there to meet them in their pony and trap and very soon they are at Cherry Tree Farm. After High Tea they go to bed exhausted from their day’s journey. On their first day at the farm the children make friends with all the animals. They explore everywhere, watching the cows being milked, and helping to feed the orphaned lambs. It is on their second night on the farm that we get our first glimpse of the character that the rest of the story will be woven around – Tammylan the wild man. Uncle Tim tells the children that Tammylan lives wild in the fields and knows everything about animals worth knowing. 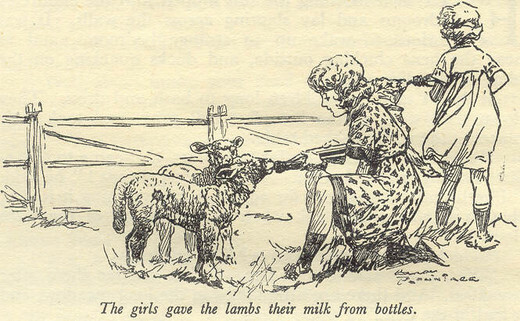 The children are tantalized at the first mention of Tammylan and at the end of Chapter III they make up their minds to go hunting for him as soon as they possibly can. A few days after that night the older children decide to look for Tammylan. Setting off with their lunch, leaving Penny behind, they search for the wild man. After a long time looking they finally eat their lunch – Rory giving the quite common ‘Anne’ (from The Famous Five) remark, “I wonder why food tastes so much nicer outdoors than indoors.” The children soon set off again when suddenly they hear a blood-curdling scream that sounds like Penny! Penny feels quite sorry for herself and decides to set out all alone, without telling anybody, to find the others. Soon she becomes hungry, tired, and worst of all lost and tries to climb a tree to get a view over the whole countryside and find out where the others are. 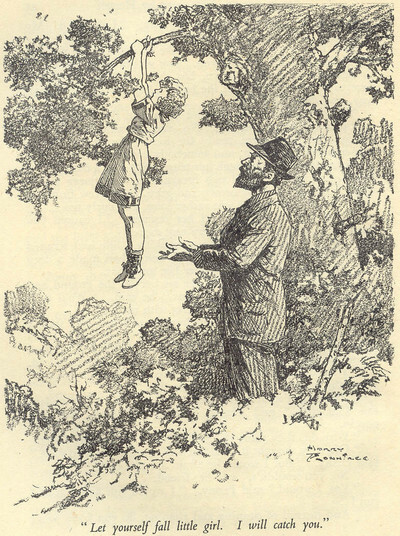 Being a town girl who has never climbed a tree in her life she finds herself hanging in mid-air when the branch she has been standing on breaks! She gives a loud scream but suddenly hears a voice beneath her. “Let yourself fall, little girl. I will catch you. You will be quite safe.” Her arms suddenly gave way but she finds herself in the arms of a man with long hair and queer eyes. The man carries her through the bracken and heather then he asks why she came so far all alone. Penny answers him saying, “The others went off by themselves to look for Tammylan, the wild man.” Penny’s very surprised when she hears that the man she’s talking to actually is Tammylan! It always makes me laugh when she treats Tammylan more like an extinct animal rather than a human saying, “Oh, Tammylan – I’ve found you, and the others haven’t! Aren’t I lucky? Tammylan takes her into one of ‘his little hidey-holes’, a cave in the hillside and puts some strange ointment on her arm which she scraped on a branch when she fell and gives her some soup made of wild roots. Meanwhile, the others are searching for Penny after hearing her scream. They track her down to the cave where she is and plan to run in like Red Indians and rescue her. The result is quite funny. The three children run into the cave much to the surprise of Penny and Tammylan but the sudden darkness means they temporarily can’t see. All they can do is stand blinking. The children ask Tammylan about stories they had heard about him. It turns out that the reason he had thrown two boys into a river and shook one boy till his head nearly fell off was because they had been cruel to the animals they had owned or the animals that had lived in the forest. A rabbit comes into the cave and sits down by the fire. It runs away when Shelia makes a sudden movement. Tammylan tells them that the rabbit, Bobtail, is one of his friends. When Benjy asks if other animals are his friends Tammylan tells him that all animals and birds are friends with him. Benjy begs Tammylan to let him come and meet them but he says no. He thinks that all children want to stone animals and take their eggs. Sheila objects saying that all children aren’t like that and he could at least give Benjy a chance. Tammylan finally agrees and says that Benjy can come as he has the low voice of those who love animals and that if the animals like him then maybe the others can come. Benjy is overjoyed. The children soon go home excited by their adventures in the forest. Nobody is more excited than Benjy. The chance to meet all of Tammylan’s friends! He could never have even dreamt of that. On their next few visits to Tammylan the real excitement will start, taking the children on many adventures – to caves, forests, tree houses, and over hills – with the wild man! I like the way Enid introduces all the characters to us at the very start (no lengthy beginnings with Blyton!) and as usual gets to the plot right away. I don’t really like the way that Penny is regularly left behind, but altogether I think it’s a beginning that certainly lives up to the rest of this very good book. Images taken from the Enid Blyton Society’s Cave of Books. This entry was posted in Book reviews, Nature and tagged Country Life, Harry Rountree, The Children of Cherry Tree Farm, The Farm Series, Written by Aaron. Bookmark the permalink.